I will always remember our day in Valparaiso, Chile as a perfect example of how travel dreams don’t match reality – and that’s OK. I think I secretly thought Valparaiso would be even a tiny bit like the busy trade port described in Allende’s Daughter of Fortune – Panama Canal be damned. It wasn’t. There is a busy port. The ascensores up the steep hills in the old town are still there and working, but Valparaiso is mostly a modern city – with colorful modern graffiti. I was a little sad, but only a little. We had a fabulous day just wandering. I thought my kids weren’t listening when I explained Valparaiso’s important role in pre-canal trade but then months later (in one of the Chinese treaty ports I think) BigB turned to me and said “Oh, this is just like Valparaiso”, so I guess they were listening after all. Read more about visiting Chile with Children. 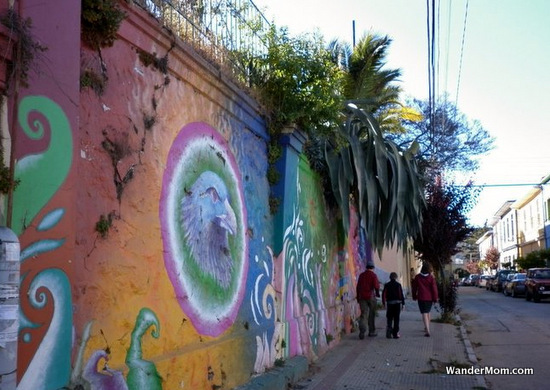 This entry was posted in Chile and tagged Chile, Valparaiso on October 26, 2012 by wandermom.